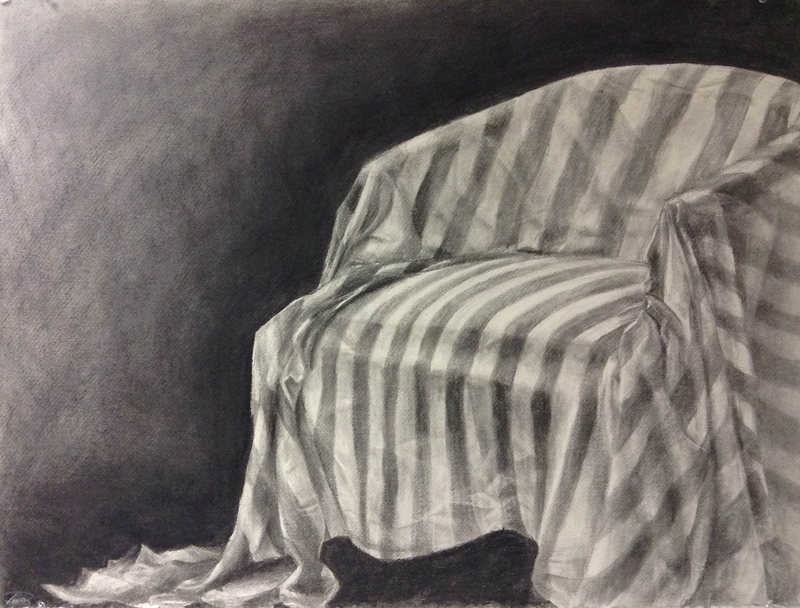 A charcoal drawing of a chair with striped fabric draped over it. The stripes not only create significantly more difficulty, but also act as an invaluable tool in accurately representing the chair. The stripes on the fabric are light gray, which is was a difficult value to put on the paper, and they were rather difficult to place accurately on a drawing. However, that point exactly is what made them helpful in creating the piece. If a stripe didn’t look right when it was drawn, it was either because it was badly drawn, or because there was a structural error in the drawing itself- which prevented me from making a few rather large errors. I’m most proud of the creases in the drawing. The fabric that drapes over the front of the seat has permanent folds set in it from being crumpled for too long. While these are rather annoying in real life, they can add more life and detail to a drawing, and small details like those give a sense of careful craft. This entry was posted in Non Time-Based and tagged Charcoal, Foundations. Bookmark the permalink.